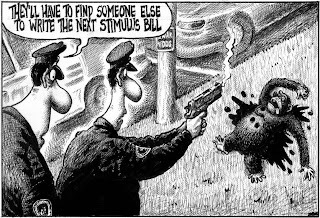 This cartoon lampoons this week's shooting of a chimp, and makes the point that the stimulus bill is obviously so stupid that a chimp could have written it, or makes the point that the stimulus bill is dangerous- like the late chimp. But the slur of equating an African-American with a monkey hangs over the entire cartoon, and there can be little doubt that this was meant to draw attention in a way that afforded plausible deniability and leaves the publication on the hook for little more than rank thoughtlessness. This is, however, a Rupert Murdoch publication we're talking about here, so the odds that this wasn't a calculated and strategic expression of borderline racist contempt for the President who beat them? Minimal.